Gyms can be a bit of a slog when you're on your own, but the new Jabra Sports Coach earphones can give you that much needed companionship on your slog to get a "ripped" torso that's like an inverted pyramid made of meat. 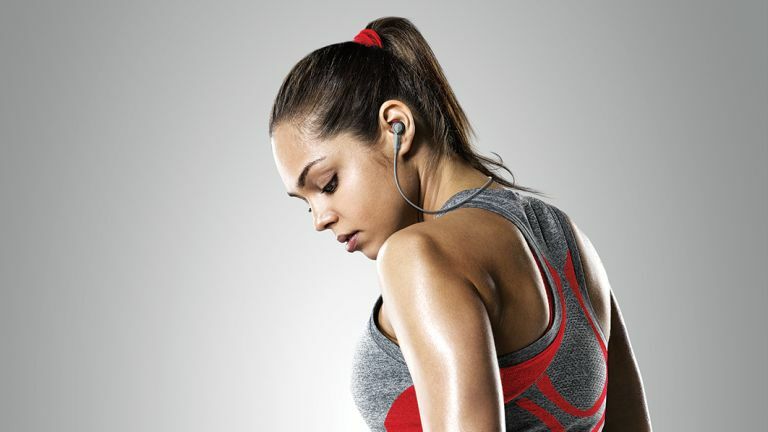 The Jabra Sports Coach wireless earphones, due for release at the end of this month and available in three colours, will set you back £119.99 so you'd be expecting a certain degree of quality, and quality is what you get. With Dolby sound, you can slam out the tunes whilst being coached, whether you happen to favour the smooth and sinuous top notes of Mozart or the bass-tacular encouragement of Flux Pavilion. Theseearphones are geared up for cross fit exercise coaching, so it's all about the press-ups, squats and core building stuff. If you're looking for a weight-lifting coach then this is the wrong Sports Coach for you. However, the up side to that is that all the exercises can be done at home with barely any equipment - that's why crossfit is such a popular idea. Mind how you drop that kettlebell near your phone, mind. There are over 40 different delightful exercises to choose from in the earphones with most programs lasting about six minutes. Don't be fooled however, these workouts are an absolute killer. If you feel that six minutes of torture isn't enough, you can add more or take off reps, and also change the rest periods in between sets of reps.
After jogging up and down on the spot, throwing my arms in the air and flailing all over the place, I broke out quite a sweat. The coach tells you what exercise to do and how many reps you should try, guiding you through the process. What the coach doesn't tell you however is how well you're doing. There's no, "Hey, you're doing great" or, “Stop. You'll have a heart attack option” type feedback. The Jabra Sport Coach earphones also lack the heart rate monitor seen on Jabra's Pulse model, though to be fair, they do cost £80 less. By downloading the Sport Life app on a smartphone, you can design your own personalised workouts with real-time audio coaching. Be careful as the customisation option could make you incredibly lazy. With max rest periods up to 10 minutes between each exercise, it would probably take you a year to burn off a sandwich if you didn't gradually reduce that amount. Where the tech works especially well is in endurance training. The built in 12-minute cooper test run measures how far you've trotted with excellent accuracy. Its ability to track progress is simple and effective, logging the data automatically so you can track previous workouts and the time you completed them with ease. If you beat your previous record with any exercise you can open the achievements tab and feel smug that you've improved. As well as the lack of a pulse monitor, there's also no motion-sensing tech built into Smart Coach. When you're doing a press up set or crunches, you have to tell the earphones that you're finished manually, so you could, technically speaking, cheat and be sitting in a café tucking into a big slab of cake, telling the device you're working out and it wouldn't know any different. Perhaps more seriously, without motion-sensing, you have to count the reps yourself, which isn't always easy in the heat of gym-based battle. According to Project Manager Jacob Lyndegaard, motion tech is likely to reach successors to this model within the next year. I only had a short time with Smart Coach but was impressed.The earphones sit super comfy in the surroundings of your ear, the sound quality is very good for a pair of fitness-oriented headphones, and the selction of workout programmes is flexible and versatile, plus you can inject some much-needed motivation into your workouts at a fraction of the cost you'd pay for a personal trainer. Admittedly, you'd hopefully get a lot more interaction from a human coach, as there's no live feedback telling how great/awful you are at press-ups here. Even so, the Smart Coach scores as an audio device, with the basic fitness "coaching" adding value. We'll delve further into this and get back to you with a full review.